This section contains instructions on how to install and use software to run predictive soil mapping and export results to GIS or web applications. It has been written (as has most of the book) for Linux users, but should not be too much of a problem to adapt to Microsoft Windows OS and/or Mac OS. Figure 2.1: Software combination used in this book. For processing the covariates we used a combination of Open Source GIS software, primarily SAGA GIS (Conrad et al. 2015), packages raster (Hijmans and van Etten 2017), sp (Pebesma and Bivand 2005), and GDAL (Mitchell and GDAL Developers 2014) for reprojecting, mosaicking and merging tiles. 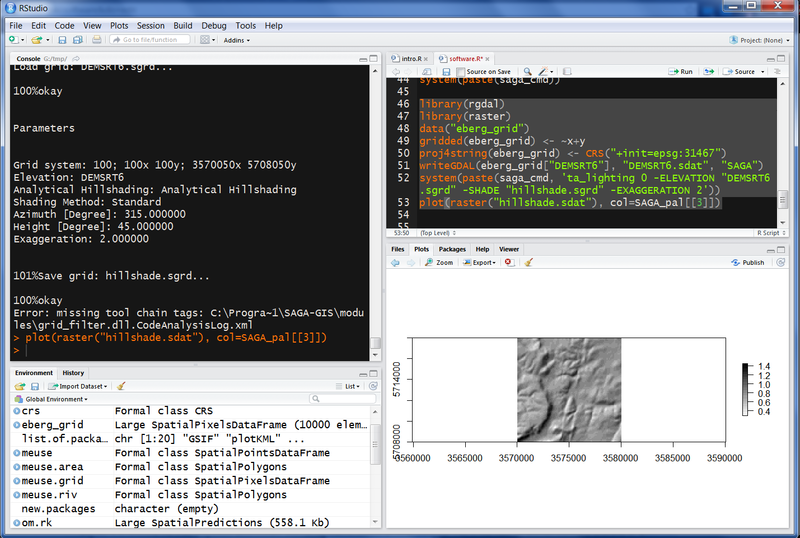 GDAL and parallel packages in R are highly suitable for processing large volumes of data. R script used in this tutorial can be downloaded from github. As a gentle introduction to the R programming language and to soil classes in R we recommend the section 3.7 on importing and using soil data. 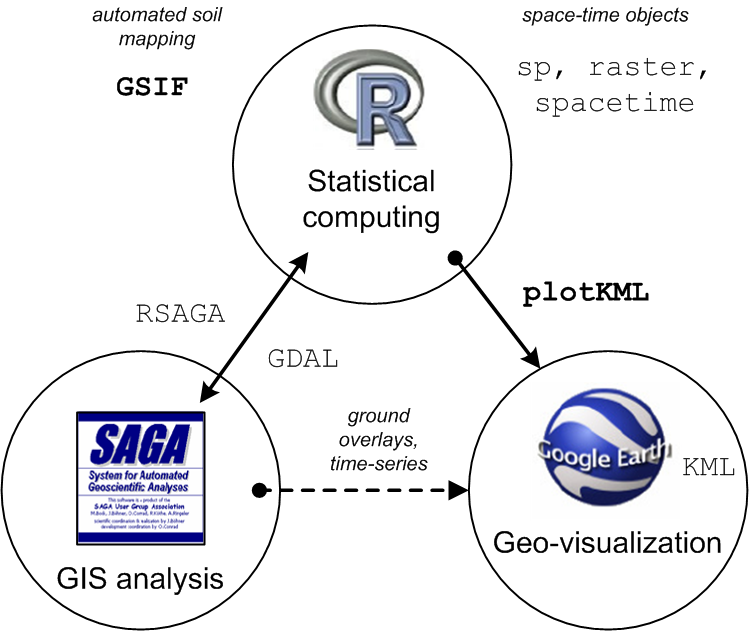 Some more examples of SAGA GIS + R usage can be found in the soil covariates chapter. To visualize spatial predictions in a web-browser or Google Earth you can try using plotKML package (Hengl, Roudier, et al. 2015). As a gentle introduction to the R programming language and spatial classes in R we recommend following the Geocomputation with R book. Obtaining the R reference card is also highly recommended. This shows, for example, that the this installation of R is based on the Ubuntu 16. * LTS operating system and the version of GDAL is up to date. Using an optimized distribution of R (read more about “The Benefits of Multithreaded Performance with Microsoft R Open”) is especially important if you plan to use R for production purposes i.e. to optimize computing and generation of soil maps for large numbers of pixels. Grolemund, G., (2014) Hands-On Programming with R. O’Reilly, 236 pages. Gillespie, C., Lovelace, R., (2016) Efficient R programming. O’Reilly, 222 pages. Wilke, C.O., (2019) Fundamentals of Data Visualization. O’Reilly, in press. WhiteboxTools (http://www.uoguelph.ca/~hydrogeo/WhiteboxTools/), contributed by John Lindsay, is an extensive suite of functions and tools for DEM analysis which is especially useful for extending the hydrological and morphometric analysis tools available in SAGA GIS and GRASS GIS (Lindsay 2016). Probably the easiest way to use WhiteboxTools is to install a QGIS plugin (kindly maintained by Alexander Bruy: https://plugins.bruy.me/) and then learn and extend the WhiteboxTools scripting language by testing things out in QGIS (see below). 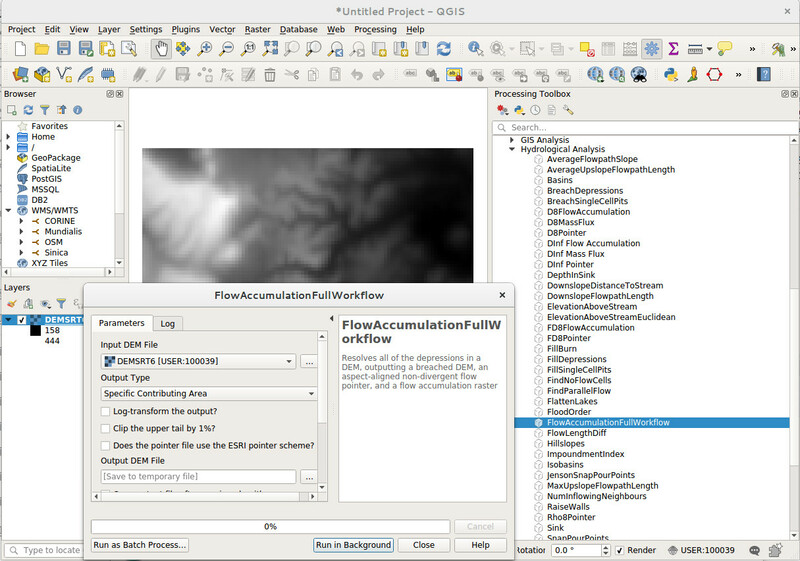 Figure 2.2: Calling WhiteboxTools from QGIS via the WhiteboxTools plugin. 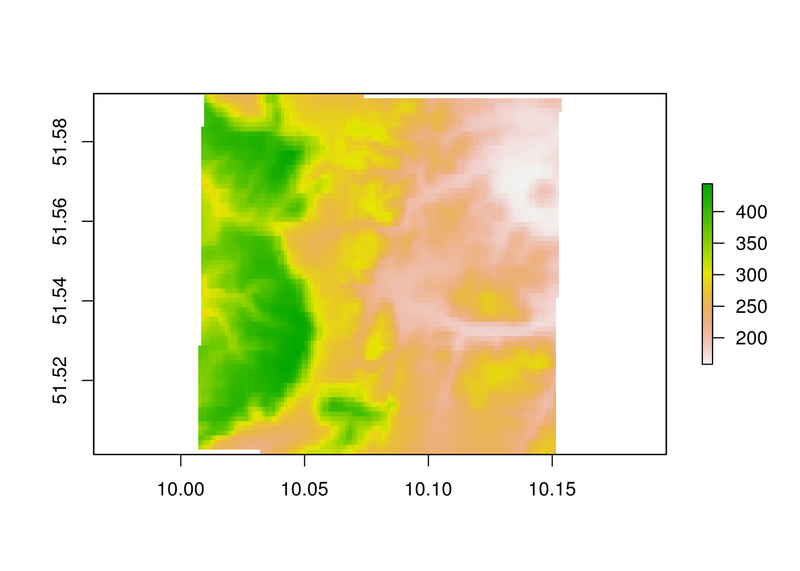 Figure 2.3: Hydrological flow accummulation map based on the Ebergotzen DEM derived using WhiteboxTools. This produces a number of maps, from which the hydrological flow accumulation map is usually the most useful. It is highly recommended that, before running analysis on large DEM’s using WhiteboxTools and/or SAGA GIS, you test functionality using smaller data sets i.e. either a subset of the original data or using a DEM at very coarse resolution (so that width and height of a DEM are only few hundred pixels). Also note that WhiteboxTools do not presently work with GeoTIFs that use the COMPRESS=DEFLATE creation options. RStudio is, in principle, the main R scripting environment and can be used to control all other software used in this tutorial. A more detailed RStudio tutorial is available at: RStudio — Online Learning. 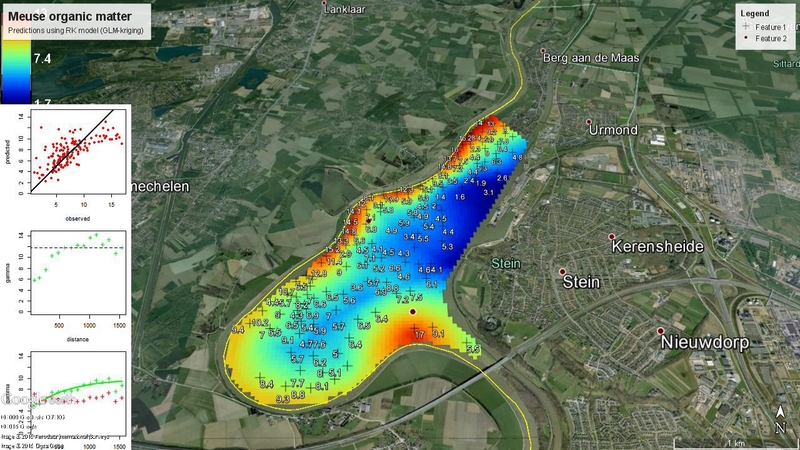 Consider also following some spatial data tutorials e.g. by James Cheshire (http://spatial.ly/r/). 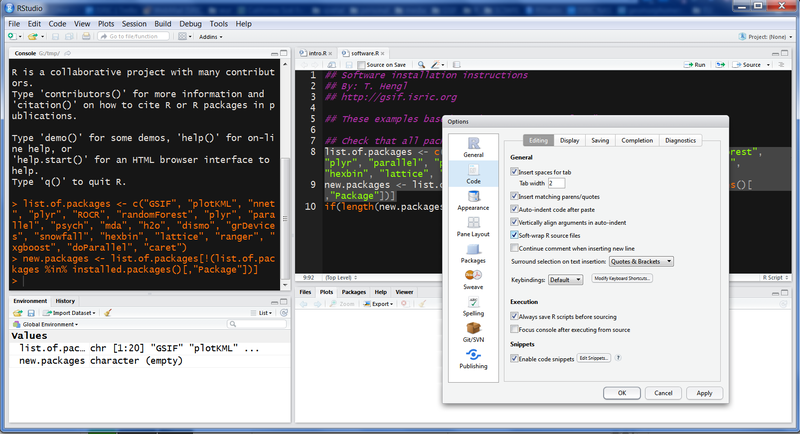 Below is an example of an RStudio session with R editor on right and R console on left. Figure 2.4: RStudio is a commonly used R editor written in C++. This will basically check if any package is installed already, then install it only if it is missing. You can put this line at the top of each R script that you share so that anybody using that script will automatically obtain all required packages. #> Type rfNews() to see new features/changes/bug fixes. #> Prediction error for 'randomForest' model estimated using the 'quantreg' package. #> Creating an object of class "SpatialPredictions"
Figure 2.5: Example of a plotKML output for geostatistical model and prediction. 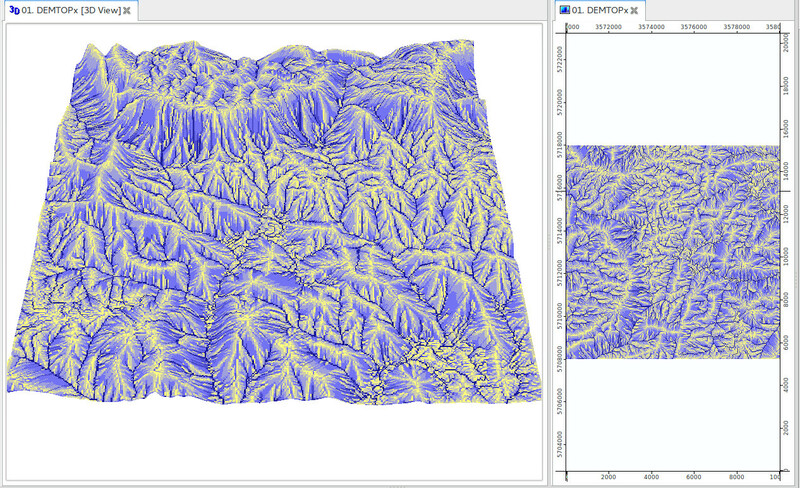 system(paste(saga_cmd, 'ta_lighting 0 -ELEVATION "./extdata/DEMSRT6.sgrd"
Figure 2.6: Deriving hillshading using SAGA GIS and then visualizing the result in R.
Figure 2.7: Ebergotzen DEM reprojected in geographical coordinates. Bivand, R., Pebesma, E., Rubio, V., (2013) Applied Spatial Data Analysis with R. Use R Series, Springer, Heidelberg, 2nd Ed. 400 pages. Lovelace, R., Nowosad, J., Muenchow, J., (2018) Geocomputation with R. R Series, CRC Press, 338 pages.